We offer full Periodontal care in our office. Part of being a concierge dental office is providing our patients with all of their needed treatment in ONE Location. We have two licensed periodontal therapists on staff so that our patients don’t have to alternate between different offices. With Periodontal (gum) disease being one of the leading causes of tooth loss, it’s vital that we provide our patients with the full range of periodontal diagnosis and periodontal gum treatment services. Surgical Treatment including bone grafting and regeneration. Treatment we provide Many adults have some form of periodontal (gum) disease. Periodontal diseases can range from simple inflammation of your gums to more serious disease that actually damages the soft tissue and bone that surround your teeth, often resulting in losing your teeth. 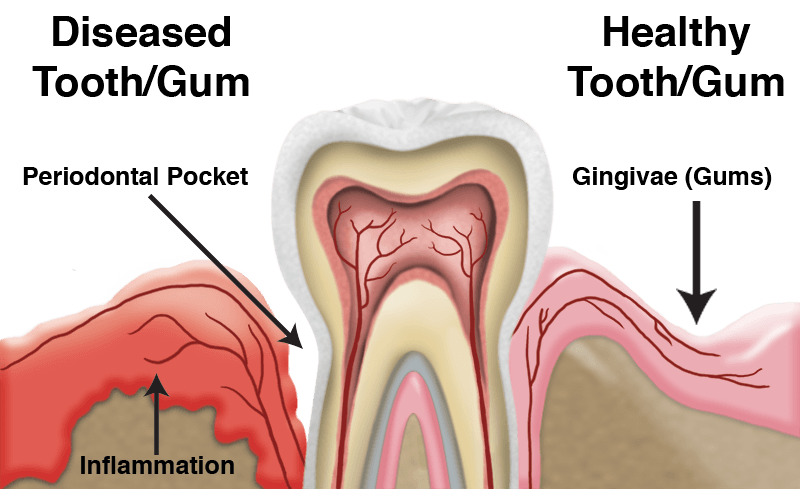 Periodontal disease is an infection causing bone loss around teeth or dental implants. It is caused by multiple factors including genetic predisposition. Identifying your personal risk factors is the first step of our Diagnosis. Over 90% of People with gum disease have NO Symptoms! The infection from the disease can progress for years without any pain or noticeable bleeding, while eating away at the bone and affecting your overall health. To add this problem, the U.S. Center for Disease Control studies show that active periodontal disease is missed 50% of the time. This is why it’s vital to have a periodontal exam with a dentist who understands how to diagnose periodontal disease. Our primary goal when treating periodontal disease is to control the infection. Dr. Linger and our Licensed Periodontal Therapists will create a custom treatment plan based on your level of disease and individual risk factors. MYTH: Tooth loss is a natural part of aging. MYTH: People who have gum disease are “dirty” and don’t brush their teeth. FACT: Research proves that up to 30% of the population may be genetically susceptible to gum disease. Despite aggressive oral care habits, these people may be six times more likely to develop periodontal disease. Identifying these people with a genetic test before they even show signs of the disease and getting them into early interventive treatment may help them keep their teeth for a lifetime. FACT: Emerging research links periodontal disease to other health problems including Stroke, Heart Disease, diabetes and respiratory diseases; preterm, low birthweight babies; stroke; osteoporosis; and diabetes. FACT: The mass of tissue in the oral cavity is equivalent to the skin on your arm that extends from the wrist to the elbow. If this area was red, swollen, and infected, you would visit the doctor. Gum disease is not a small infection. Its result, tooth loss, leads to a very different lifestyle—dentures. The changes in your appearance, breath, and ability to chew food are dramatic. FACT: Bleeding gums are one of nine warning signs of gum disease. Think of gum tissue as the skin on your hand. If your hands bled every time you washed them, you would know something is wrong. Other signs of gum disease include: red, swollen or tender gums; sores in your mouth; gums that have pulled away from the teeth; persistent bad breath; pus between the teeth and gums (leaving bad breath); loose or separating teeth; a change in the way the teeth fit together; and a change in the fit of partial dentures. Periodontal gum treatment is required typically. FACT: New periodontal procedures including local anesthesia and over-the-counter medications, have made patients’ treatment experiences pleasant and comfortable. Many patients find they are back to normal routines on the same day or by the next day. What is Microscope Enhanced Gum Therapy (MEGT)? MEGT is Non-Surgical Treatment of Periodontal Disease that previously was only treatable through surgery . Elimination of infection and in many cases, bone is regenerated. Removal of deposits of Calculus(Tarter), Bacterial Biofilm, and Granulation Tissue(Scar Tissue that harbors bacteria). Use of Specialized Instruments for cleaning below the gum line. Irrigation of Periodontal Pockets with Medicated Solution. Placement on Antibiotic directly in the Periodontal Pockets. Is this the same as Scaling and Root Planing or ‘Deep Cleaning’? MEGT treatment in our office is much more extensive than what typical dental offices call Scaling and Root Planing or ‘Deep Cleaning,’ in that it treats areas of moderate to severe periodontal disease and can regenerate bone without surgery. Typical Scaling and Root Planing works for pockets 5mm or less. In cases of 6mm or greater, Surgical Procedures are usually indicated. With MEGT, we utilize specialized periodontal instruments and surgical microscopes that are able to see under the gumline, including pockets deeper than 5 or 6mm. MEGT eliminates the need for Periodontal Surgery in over 97% of cases with 6mm pockets or higher. The fee for this service and the time allotted is based on the individual needs of the patient and the severity of the disease. Most offices when scheduling for Scaling and Root Planing, allow 45 minutes to one hour for a quadrant regardless of the severity of the disease. The surgical microscope has a magnification range of two to twenty-six times that of the naked eye.